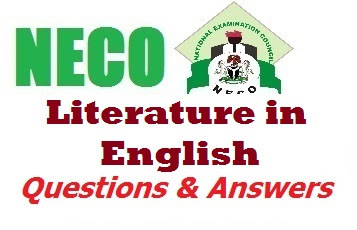 First and foremost, This is a NECO Literature in English Objective & Theory past question and answer curled from old NECO question papers available in bookshops in Nigeria. Meanwhile, the purpose of this article is to show students the how they are supposed to answer the objective and theory section of this 2017 NECO OBJ & Prose - Literature in English. As a matter of fact, Do not attempt to use them in the exam hall because they are not this year's current exam questions and answers. All things considered, the theme of widowhood is the novel’ s central theme. The widows in Lonely Days were subjected to pain and humiliation. The widowhood experiences of Yaremi, Dedewe, Fayoyin and Radeke are a miscrosm of the plight of widows in the larger Nigerian society and in the African continent as a whole. The author condemns widow inheritance, forced remarriage and other cultural practices that subject widows to pain and humiliation. Another important theme that runs through the novel is the theme of loneliness . Yaremi was very lonely and had to do most things by herself. For instance , she had to appeal to Uncle Deyo, Ajumobi’ s friend to assist in mending her leaking roof and rebuilding the walls of her house. Yaremi suffered humiliation from extended relations who accused her of killing her husband. For this reason, Dedewe, Fayoyin and Radeke also suffered humiliation. For instance, Dedewe was made to sit in a dark room by her husband ’s corpse while Fayoyin ’s hair was badly shaved. First and foremost, Matilda, the beautiful and good daughter of Manfred, is intrigued by the portrait of the young Alfonso the Good that hangs in her castle. On the other hand, it is clear that she longs for someone like Alfonso in her life. She begins to get to know Theodore when he is imprisoned and realizes that he is a man of quality. Matilda has never been close to her father and is trying to figure out why he is so intent on bringing Isabella back to the castle. For instance, when all of the men leave the castle to find Isabella , Matilda frees Theodore and insists that he leaves the castle to save his life. She has noticed that Theodore resembles the picture of the former prince, Alfonso, and she falls in love with him. Before Manfred can find Isabella and force her to marry him , a huge entourage of knights and courtiers arrive in search of Isabella. One of the knights, unbeknownst to Manfred, is Frederic, Isabella’s father. When Theodore escapes the castle, he goes to a wood, and finds a cave. Equally important, he accidentally meets up with Isabella and vows to protect her. In the meantime, all of Manfred’s men and Vincenza, as well, are looking for Isabella. Additionally, Vincenza finds the cave, and Theodore fights with him, nearly mortally wounding the man, without realizing that Vincenza is Isabella’s father. Generally speaking, Mary’s importance to the novel stems not only from her death, which represents the clear turning point in Bigger’s life, but from her insidious form of racism, which is among Wright’s subtlest criticisms of white psychology. Ordinarily, Mary Dalton self-consciously identifies herself as progressive; She defies her parents by dating a communist, cares about social issues, and is politically and personally interested in improving the lives of blacks in America. In either case, though Mary’s intentions are essentially good, however, she is too young and immature either to commit fully to her chosen causes or to attain a sophisticated understanding of those people she seeks to help. In short, Mary attempts to treat Bigger as a human being, but gives no thought to the fact that Bigger might be surprised and confused by such unprecedented treatment from the wealthy white daughter of his employer. Mary simply assumes that Bigger will embrace her friendship, as she supports the political cause that she believes he represents. Given these points, Mary has the best of intentions, she treats Bigger with a thoughtless racism that is just as destructive as more overt hypocrisy of her parents. Interacting with the Daltons, Bigger at least knows where he stands. Mary’s behaviour, however, is disorienting and upsetting to him. Ultimately, Mary’s thoughtlessness actually ends up placing Bigger in serious danger, while the only risk she herself runs is mild punishment or disapproval from her parents for her disobedience. She does not stop to think that Bigger could easily lose his job or worse if he upsets her parent. Mary unthinkingly puts Bigger in the position of being alone with her in her bedroom, and her inability to understand him and the terror he feels at the prospect of being discovered in her room proves fatal.